When encryption expert Jon Reynolds' wife and two young children are killed by 'friendly fire' during a drugs bust, their deaths are deemed to be justifiable homicide. Using his encryption knowledge, Jon makes it his mission to trace the billions of illegal drugs money through the cartels, the banking system and financial markets. He enlists the aid of Journalist Katie Ruiz in his endeavor to expose those at the top of the chain and facilitate their public downfall. If they can pull it off it will be the scoop of the century... but not without putting their own lives at risk. 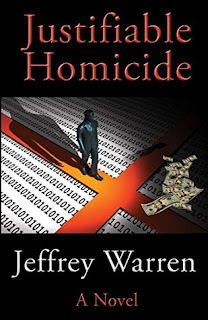 Justifiable Homicide is one of the most expertly executed thrillers I have read for a long time. The author's knowledge of computer encryption appeared to be vast and at times left me open-mouthed with genuine amazement. Yes, there was a great deal of what I term 'technical-speak' but in my opinion it created depth to the story and raised the book to greater heights. The two main protagonists, Jon and Katie, are fully developed and entirely believable; both wrestling with damaged pasts whilst trying to create better futures. What really makes this novel work on many levels is its credibility; the events described are plausible and could be happening at this very moment. It's based on real facts and that thought was foremost in my mind as I read. In my opinion Jeffrey Warren has created an accomplished piece of writing and is well-deserving of place alongside the top authors in this genre. My thanks to author Jeffrey Warren for providing a copy of this book. The $500 billion-a-year illegal-drug-trafficking business has a secret relationship with seemingly legitimate bankers and mainstream financial markets which is exposed by a story in the press that reverberates on front pages around the world. The question that even legitimate investigators seem not to be asking is: "Where's the Money?" Unlikely partners Jon Reynolds, PhD (computer-encryption wunderkind who has a personal, vested interest in the outcome), and Katie Ruiz, a talented investigative reporter with a checkered past, devise a dangerous and clandestine plan to expose the business and the players in it — as well as to reveal to the general public the staggering proportions of the scheme. Implementing it means Jon and Katie will face cartels, violence, corruption, and an inept DEA — in addition to their own fears and demons. This is a story grounded in real facts that exist in the real world — our world. It is also a telling statement about the impact that ordinary citizens can have on world events — an unlikely "Power of One" tale.